Sender Jarmulowsky (1841-1912) established his bank downtown on the East Side in New York City in the 1870s, but the present building at the southwest corner of Canal St. and Orchard St. dates only from 1912. As described by Christopher Gray in his New York Streetscapes, 2003, "The Jarmulowsky Bank Building, 54-58 Canal Street: [Sender Jarmulowsky] arrived in the United States from Russia in the early 1870s and by 1878 had established a bank in an existing building at the southwest corner of Canal and Orchard Streets, already an immigrant district. In 1886, 1890, 1893, and 1901, he experienced various bank runs but proudly paid one hundred cents on the dollar to each panicky depositor. All four of his sons followed him into banking, with Meyer and Louis opening their own bank in an exotic, Moorish-style building - designed by Meyer himself - at 165 East Broadway in 1903. When the father decided to rebuild at the southwest corner of Canal and Orchard, he chose neither Meyer nor a showy design. In 1912, with the architects Rouse & Goldstone, he put up a reserved, twelve-story loft building with a bank on the ground floor at the same corner where he had established himself thirty years earlier. ... Sender Jarmulowsky died in 1912 as his building neared completion; the Times noted he left 'only $501,053' as an estate, apparently expecting much more. His sons Harry and Louis continued the business. In 1914, the East Broadway bank was closed by the state, and Meyer Jarmulowsky was attacked by a depositor with a knife. In 1917, as depositors withdrew nearly $3 million to send to overseas relatives caught in the war, the State Banking Department took over Sender Jarmulowsky's bank, too. It had liabilities of $1.25 million and assets of only $600,000. Over five thousand depositors crowded around the branch, and Harry and Louis Jarmulowsky were indicted for banking fraud later in the year. The bank never reopened, and the building was sold at a bankruptcy auction in 1920. ..."
Construction of 54-58 Canal St. was announced in the New York Times, 28 May 1911, part 8, pg. 1, "Evidence of the building movement which began on the lower east side this Spring is shown by the demolition of a number of old buildings on the southwest corner of Canal and Orchard Streets, preparatory to the erection of the Jarmulowsky Bank. The structure will be an innovation for the east side, being the first strictly highclass tall bank and office building in the entire section. The building will be twelve stories in height, with basement, strictly fireproof throughout, and has been designed to equal in every respect the highest grade bank buildings throughout the city. The bank portion proper occupies the basement and first and second floors of the corner portion. The banking room is approximately 25 by 75 feet, with a vaulted ceiling 25 feet in the clear. The officers' rooms and bookkeeping department occupy a large mezzanine outside of the banking room proper. The interior will be finished in marble and caen stone, with bronze and marble railings, screens, &c. The remainder of the building will be utilized for stores on the first and second floors, with offices and showrooms above. There will be two high-speed elevators and every requisite for a building of this character. The building will be surmounted by a tall tower extending 200 feet above the curb. The entire operation is in charge of the architects, W. L. Rouse and L. A. Goldstone, who have awarded the general construction of the Princeton Construction Company. The contract for the banking quarters will be awarded separately. The total cost is estimated at $350,000, and the building is expected to be ready for occupancy by March 1, 1912." The following appeared in the New York Times, 2 June 1912, pg. 13, "Sender Jarmulowsky, banker, of 68 Orchard Street, died yesterday morning after a short illness, from heart disease, at his home, 16 East Ninety-third Street. He was born in Drajewo, Russia, seventy-one years ago. In 1867 he established a banking business in Hamburg and in 1873 came to America, founding the banking establishment of S. Jarmulowsky, in Canal Street, continued as the present firm. Mr. Jarmulowsky was interested in a number of charities. He is survived by his wife, two daughters, and four sons." Of his sons who continued the business after Sender Jarmulowsky's death, Meyer Jarmulowsky (1867-1947) and Louis Jarmulowsky (1869-1932) were primary. Other sons involved in the business were Albert Jarmulowsky (1865-1943), Harry Jarmulowsky (1877-1947), and Adolph Jarmulowsky (1883-1908). The following described the bank's failure in 1917 (New York Tribune, 12 May 1917, pg. 16): "S. Jarmulowsky's Bank, at 54 Canal Street, was closed yesterday and put in charge of a state examiner. A statement by Eugene Lamb Richards, State Superintendent of Banks, explained that while the department was examining the affairs of the bank the bankers, Harry and Louis Jarmulowsky, announced their purpose of suspending payments due to a lack of liquid assets and the danger of sacrificing securities at forced sales. There are nearly 7,000 depositors, it is said, though only a few hundred appeared at the bank yesterday. The deposit liabilities are about $1,250,000. Since the outbreak of the war the bank is said to have liquidated nearly $3,000,000 of deposits. The attitude of the numerous alien depositors since the entry of the United States into the war and the effect of the war on their securities are said to be largely responsible for the plight of the bankers. An involuntary petition in bankruptcy was filed against Harry and Louis Jarmulowsky, individually and as bankers, yesterday, and the principal claimants being the following depositors: Morris Eiseman, $1,000; Century New Company, $800, and Rohman & Co., Inc., $10. 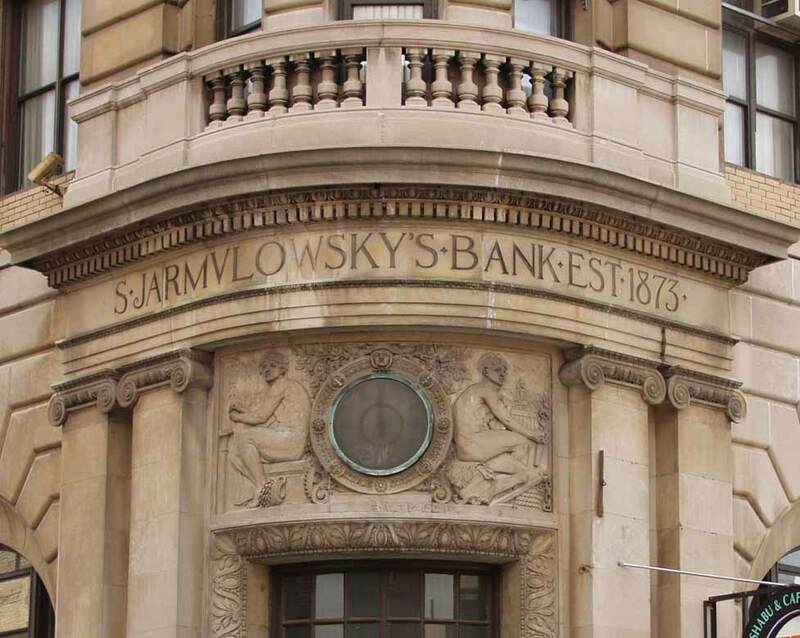 Sender Jarmulowsky, founder of the bank, who died in 1912, was the father of Meyer Jarmulowsky, whose banking firm, M. & L. Jarmulowsky, 164 East Broadway, failed at the beginning of the war. This institution had 15,000 depositors, with claims aggregating $1,667,000. From the day that Sender Jarmulowsky entered the banking business on the East Side, in 1873, until his death, it was his boast that he had never suffered a failure." Following the bank failures the Jarmulowsky sons adopted other ways of life. Harry Jarmulowsky, who was a physician, moved to Paterson, New Jersey, and practiced medicine. His obituary in the New York Times, 28 Jan. 1947, pg. 24, read, "Paterson, N.J., Jan. 27 - Dr. Harry Jarmulowsky, a general medical practitioner here since 1917, died of a heart attack here today in his home at 181 East Thirty-third Street. His age was 69. Born in New York, he attended City College, and Columbia University, received his M. D. degree from Kiel University in 1906 and did post-graduate work at Johns Hopkins University. He practiced in New York before he came here." Others of the Jarmulowskys changed their name. Louis Jarmulowsky became Louis Jarmel. Albert Jarmulowsky became Albert Jarmel. And Meyer Jarmulowsky became Meyer Jarmuth. Louis Jarmulowsky appeared in the 1925 New York State Census as Louis Jarmel, age 54, living at 15 East 10th St., Manhattan, when his occupation was "Manufacturer, Shirts." Louis's death notice in the New York Times, 19 Oct. 1932, pg. 19, read, "Jarmel - Louis, on Oct. 18, devoted husband of Ida and father of Benedict, Dorie and Faie Winner. Services at Riverside Memorial Chapel, 76th St. and Amsterdam Av., on Wednesday, Oct. 19, at 1:30 P.M. Interment Mount Zion Cemetery." Albert Jarmulowsky was recorded as Albert Jarmel, age 70, on the ship manifest of the SS Ilsenstein sailing from Antwerp 3 May 1935. He gave his date of naturalization as 19 Nov. 1893. His address was 104 W. 70th St. New York, NY, "c/o Emil Meitner, Hotel Walton." Albert Jarmulowsky died age 78, 16 June 1943, in Manhattan. Albert's death notice in the New York Times, 17 June 1943, pg. 21, read, "Jarmel - Albert, devoted father of Arthur, Alice, Dorie Meitner, Alfred, Erwin, Walter and Adolph. Services Thursday, 3 P. M., at 'The Riverside,' 76th St. and Amsterdam Ave."
Meyer Jarmulowsky appeared in the 1930 U. S. Census as Meyer Jarmuth, living in Vineland, New Jersey, when his occupation was "Real Estate." Meyer's death notice in the New York Times, 19 Feb. 1947, pg. 25, read, "Jarmuth - Meyer, devoted husband of the late Fanny, beloved father of Sally Hollender and Edwin M. Jarmuth, grandfather and great-grandfather. Services Park West Memorial Chapel, 115 West 79th St., Thursday, at 12:30 P. M."
From 1948 to 1964 the Jarmulowsky Bank building was home to the H. W. Perlman Piano Co.